Particularly with FMCGs, consumers can be creatures of habit. All they wanted was for people to try it – here’s how the Sunbites campaign exploded exposure with just the right blend of social and interactive. 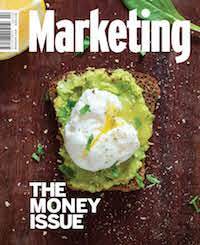 Connecting with consumers can be a challenge for FMCG brands and they often rely on costly and inefficient sampling to engage with the key grocery decision-makers in a household. Being able to identify and engage the right influencers for a campaign can be an effective way to target sampling with the right audiences and allow them to tell the story of their experience to friends and followers, amplifying the impact of this direct experience. With a bespoke and innovative technology solution, the partnership between Social Soup and the PepsiCo Smiths Snackfood range Sunbites aimed to reduce friction in the sampling process by eliminating the need to send product out. 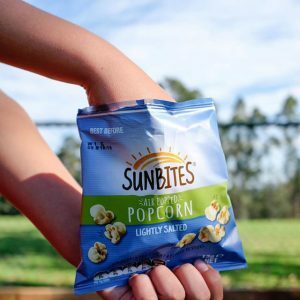 Sunbites via Grain Waves first hit the Australian FMCG market in 2009. 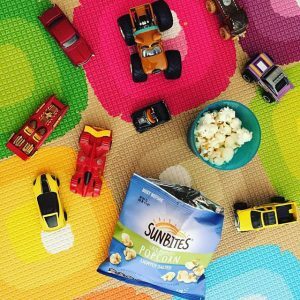 Since then, the brand has continued to innovate, including the introduction of Sunbites Snack Crackers in mid-2017. 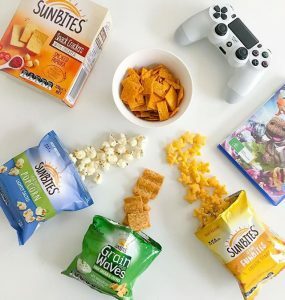 Sunbites Snack Crackers introduced a ‘better for you’ snacking option to share, snack on alone or add to the lunchbox. The launch product performed very well for quality, loyalty and repeat purchase, but the challenge was for consumer consideration in a category dominated by the heritage brand Shapes. of Social Soup’s Sunbites Snack Crackers campaign was trial. Social Soup was able to bring unique expertise to the secondary objectives, which were to create awareness and relevance around the range, proposition, tone of voice and in which aisle they sat. In terms of social conversations, the objective was to amplify the product’s creative direction ‘Celebrate the Small Stuff’; specifically, that snacking should be fun, simple and healthy, and not compromise on taste, but be a fun part of an everyday eating routine. Trial is undeniably a powerful way to activate change in behaviour. It creates an avenue to capitalise on product benefits, creates desire and consideration and can literally change behaviour. with FMCG goods is considered very transactional, not allowing for rich and deep interactions with the brand. vouchers could be redeemed in-store. 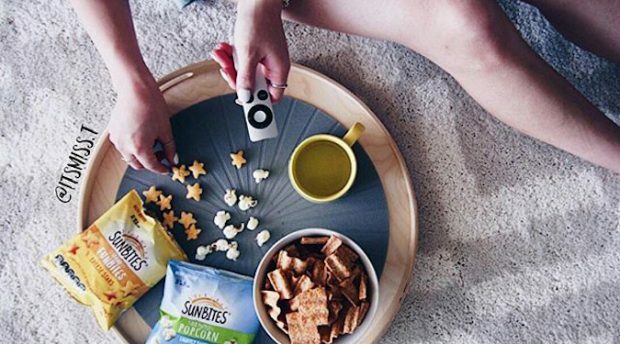 Research conducted by the company shows a decisive link between finding a product a consumer likes and the likelihood of then sharing that new discovery on Instagram – this is particularly true for the snack food category. Furthermore, sharing this information on social media leads to action: according to Social Soup’s research, after seeing a new snack food on their Instagram and/or Facebook feeds, 59% of people will go in-store to see, try and buy the product. Social Soup’s social sampling platform combined trial with pathway to purchase – driving targeted consumers to trial a product in-store from the shelf, interrupting the pathway to purchase in an organic and familiar manner. The process facilitates an authentic experience with which consumers are familiar and can easily replicate during their next shopping trip. Additionally, its social sampling campaign created andcaptured on and offline conversations. Samplers share content online through their social media accounts and their stories with offline networks – friends and family, traditional word of mouth. This campaign was the first time the voucher technology had been rolled out in Australia. Social Soup designed a campaign with a tiered influence approach to generate large-scale brand awareness and generate trial and behaviour change to choose ‘better snacks for you’. The process allowed Social Soup to know customer locations and track their full experience journey with the product, get feedback and also reward them for sharing in social media, which provides authentic influence from a real experience. One of the traditional challenges of sampling campaigns has been the cost of getting product to people to consume in their home, creating a real-world experience. The voucher delivery system in the Social Soup app knows when a customer has the product in their hand and we can deliver a voucher to them to redeem at the checkout. 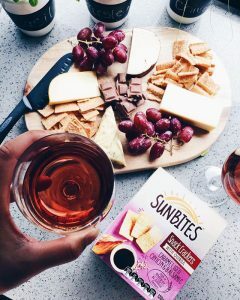 Using the app, 2300 targeted sampling influencers scanned the Sunbites products in Woolworths and Coles stores and were given a voucher to redeem at the checkout, scaling trial on the path to purchase. Social Soup also recruited 50 micro influencers, who received premium product packs, personally delivered, to engage their social communities and create high quality influencer generated content. 2300 targeted sampling influencers and 50 micro influencers, who delivered a combined reach of more than 1.2 million people. The campaign also saw more than 2000 social posts created, more than 200 reviews and strong positive sentiment (82% and 4.8 out of five-star rating from 219 reviews) as tracked by Social Soup’s bespoke AI analysis. The AI analysis demonstrates one of its industry leading capabilities. In-app technology facilitated in-store sampling from consumers’ local supermarkets via the voucher system. It smoothly enabled scalable trial, social reach, reduced lead times, full transparency, targeting, product education, brand awareness and trial.